BANGKOK, March 19, 2019 /PRNewswire/ — Thai business now features in the influential World’s Most Ethical Companies register with the inclusion of DTGO Corporation Limited, marking a milestone for the country’s corporate sector. DTGO is the first Thai honoree in the global ranking since the list launched in 2007. The group’s success shows how ethics and social responsibility go hand in hand with business success, said DTGO President Mr Raj Tanta-Nanta. “DTGO was set up to sustain social contribution with business achievement,” he said. 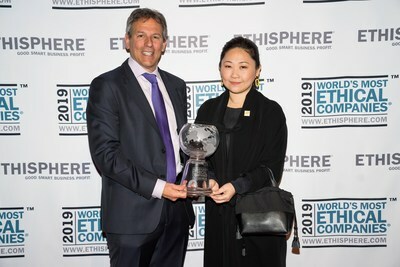 DTGO’s founder and CEO, Mrs. Thippaporn Ahriyavraromp, represented the group in New York at the World’s Most Ethical Companies Honoree Gala in New York on 12 March. DTGO ranks among 128 firms worldwide in the 2019 World’s Most Ethical Companies. The list features many famous brands and multinationals, reflecting the designation’s rigor and prestige. The US-based Ethisphere Institute selects businesses each year based on its Ethics Quotient (EQ), covering ethics and compliance program, culture of ethics, corporate citizenship and responsibility, governance, and leadership and reputation. DTGO is a diversified group active in Thailand and China with businesses in property development, trading, design, finance, and technology. The group dedicates 2% of its topline revenue to social and environmental initiatives. Channeled mainly through the Buddharaksa Foundation and the DT Families Foundation, these funds support projects in education, healthcare, and the environment. DTGO’s best-known subsidiary is MQDC – Magnolia Quality Development Corporation Limited. MQDC is a property developer with a portfolio including ICONSIAM, a $1.65bn joint-venture megaproject along the bank of Bangkok’s Chao Phraya River. MQDC has built 3 of Thailand’s 10 tallest buildings and recently started constructing The Forestias, a 119-acre sustainable, healthy living district in Bangkok. DTGO also includes Dees Supreme, a trading company, and DT Design, an architecture and design studio. Shanghai-based DT Plans provides consulting for design, project management, and construction of property projects across China.